CHARLESTON, W.Va. -- West Virginia's striking teachers cheered and applauded Tuesday as lawmakers acted to end a nine-day classroom walkout, agreeing to grant them 5 percent pay hikes that are also being extended to all state workers. A huge crowd of teachers packing the Capitol chanted jubilantly, sang John Denver's "Take Me Home, Country Roads" and some even wept for joy at the settlement. Gov. Jim Justice later signed the bill authorizing the raise, saying it's important to stop seeing education as a necessary evil that just needs to be funded and start seeing it as an investment. It came on the ninth day of a crippling strike that idled hundreds of thousands of students, forced parents to scramble for child care and cast a spotlight on government dysfunction in one of the poorest states in the country. The West Virginia teachers, some of the lowest-paid in the nation, appeared to have strong public backing throughout their walkout. "We love our kids!" teachers chanted, hugging one another and cheering. "We overcame, we overcame!" said one teacher, Danielle Harris, calling it a victory for students as well. "It shows them how democracy is supposed to work, that you don't just bow down and lay down for anybody. They got the best lesson that they could ever had even though they were out of school." The teachers' call for action attracted support from all over the country, CBS News correspondent Meg Oliver reports. Teachers in San Francisco sent more than 500 pizzas, and educators from as far as Michigan traveled to protest alongside them. "They are sacrificing to be here, and they want to be back in their classrooms," said Lily Eskelsen Garcia, president of the National Education Association. 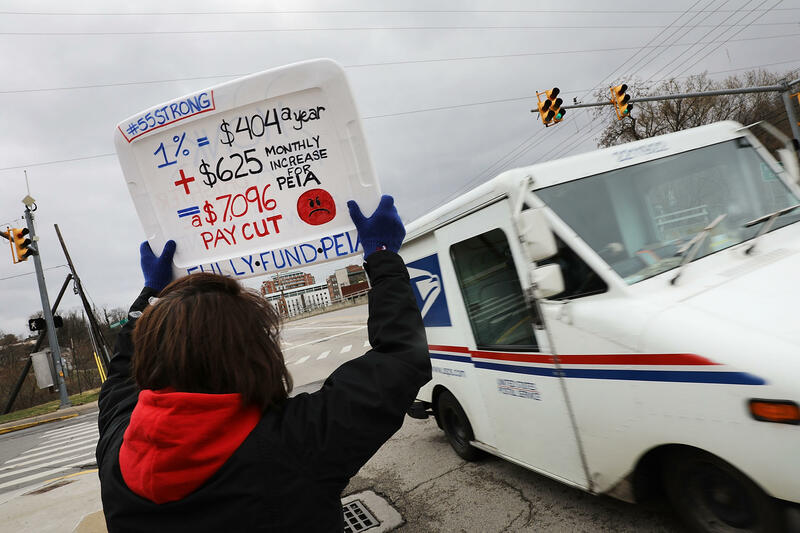 Teachers walked off the job Feb. 22, balking at a bill signed by Justice to raise their pay 2 percent in the first year as they also complained about rising health insurance costs. Justice responded last week with an offer to raise teacher pay 5 percent, gaining swift House approval though the Senate countered with 4 percent - a number rejected by the teacher unions, extending their walkout. "I believe in you and I love our kids," Justice told teachers after Tuesday's agreement on 5 percent was announced. Several county school systems announced they would be reopening Wednesday. It wasn't immediately clear whether all 55 county school systems would reopen. A state Department of Education spokeswoman didn't return an email message. Missed school days will be made up, either at the end of the school year or by shortening spring break, depending on decisions by individual counties. After a six-member conference committee agreed to the raises, the House of Delegates subsequently passed 5 percent raises for teachers, school service personnel and state troopers on a 99-0 vote. The Senate followed, voting 34-0. State teachers haven't had a salary increase in four years. "The winners in this are the students of West Virginia and the educators across West Virginia who finally see a true investment in education," West Virginia Education Association President Dale Lee said. Senate Majority Leader Ryan Ferns, R-Ohio, said talks with the governor's office lasted into early Tuesday identifying cuts everyone could agree to. A show of support by thousands of teachers and supporters on Monday didn't sway lawmakers in time to avoid a ninth day of canceled classes for the school system's 277,000 students and 35,000 employees. The Capitol was briefly closed Monday after 5,000 people entered the building, posing security concerns. It was reopened an hour later, and teachers vented their frustration over the lack of progress. With 17.9 percent of West Virginians living below official poverty levels, teachers, bus drivers and other volunteers were collecting food for students who rely on free breakfasts and lunches. Teachers also were sharing stories of donating their time, money or food. At least two GoFundMe pages have been launched in support of the walkout. Rachel Stringer, a stay-at-home mom from Cross Lanes, said her biggest challenge was making sure her children don't forget what they've learned this school year. Despite the long layoff, Stringer supports the teachers.